It’s easy to see what the Vikings see in Aruna. He really looks the part of an NFL defensive end and reminds you of Danielle Hunter. Drafted: 218th overall, as the latest African-born player drafted into the NFL. Others include former Vikings players Madieu Williams (Sierra Leone) and Gary Anderson (South Africa). It’s easy to see what the Vikings see in Aruna. He really looks the part. Aruna’s build (6-5, 262 pounds, 34-inch arms with 10 5/8-inch hands) is comparable to Danielle Hunter, the formerly raw LSU talent molded into an NFL defensive end. Aruna himself has played just five seasons of football. Off the field, he has stories to tell. As a teenager, Aruna left his family in Nigeria to pursue a basketball scholarship in the U.S. He didn’t get into football until his senior year of high school. He didn’t even tell his parents about it until Aruna signed a letter of intent to play at Tulane. “[My father] doesn’t know the game,” Aruna said, “I have to tell him, ‘Dad, don’t worry. I’m the one delivering the blow. I’m not taking it.” They’ve never seen him play football in person, so Aruna hopes to one day “very soon” change that. Despite low production as a senior, Aruna balled out at the NFL scouting combine to put himself firmly back on the radar. His defensive-line best vertical jump (38.5″) and broad jump (128″) were paired with a 4.6-second 40-yard dash (2nd among DL) and 4.48-second 20-yard shuttle (6th among DL). Not many men his size can move that quickly. Aruna showed it on the basketball court, where he originally played in high school, and wasn’t shy about sharing his matchup once with Andrew Wiggins. “I gave him one of the lowest-scoring games of his high school career that night,” Aruna said. “It’s going to be a process with him because he’s a young, raw guy,” head coach Mike Zimmer said. “Probably everything is going to be new: getting into the right stance, taking the right footwork, putting your hands in the right place.” Once camp and preseason games roll around, Aruna will have the chance to show off his progress. Aruna is another raw, talented pass rusher being stashed on the Vikings roster. How will the numbers game shake out in 2018? 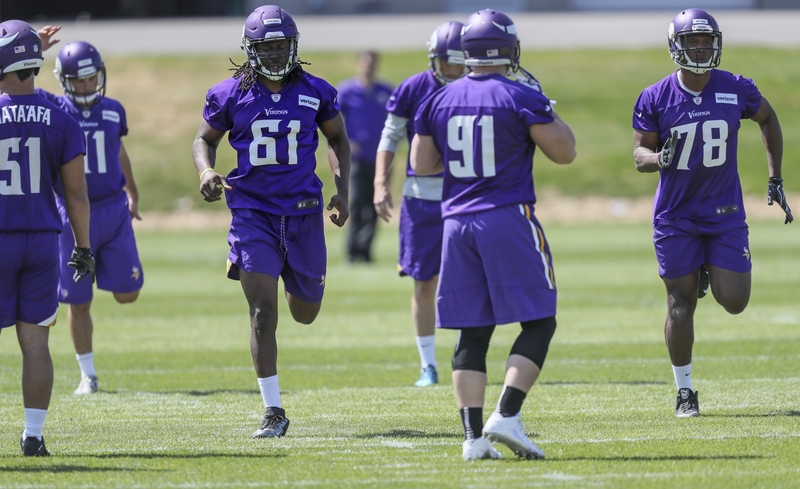 Two years ago, the Vikings promoted a rookie Stephen Weatherly to the active roster after another team tried to sign him off their practice squad. Now Aruna is the sixth defensive end behind the same five that made last year’s 53-man roster: Hunter, Everson Griffen, Brian Robison, Weatherly and Tashawn Bower.